Established in 1956, Bruce Aerospace is an elite designer and producer of interior lighting components and systems for commercial and military aviation. 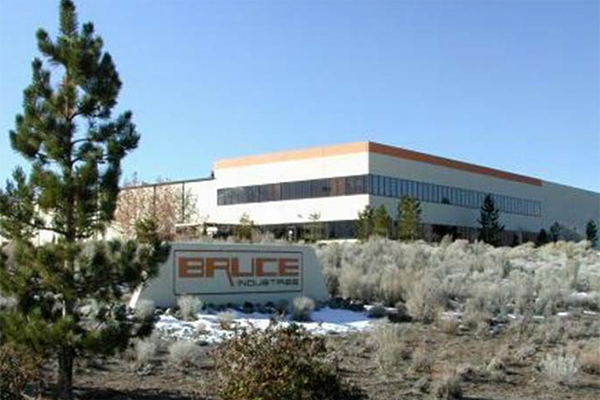 Our state-of-the-art manufacturing capabilities coupled with decades of experience along with maintaining key certifications make Bruce the clear choice for your lighting needs. AS9100 Quality System certified ensures continuous improvement in the quality of our products and processes. Bruce Aerospace provides the highest level of product support. That includes an industry best 6-year warranty. Highly engineered solutions with an excess of 50,000 hours of usage with no color shift or light output degradation. FAA certifications and licenses, including OEM approvals with Airbus, Boeing, Bombardier, Gulfstream, Embraer, Antonov and SAAB. 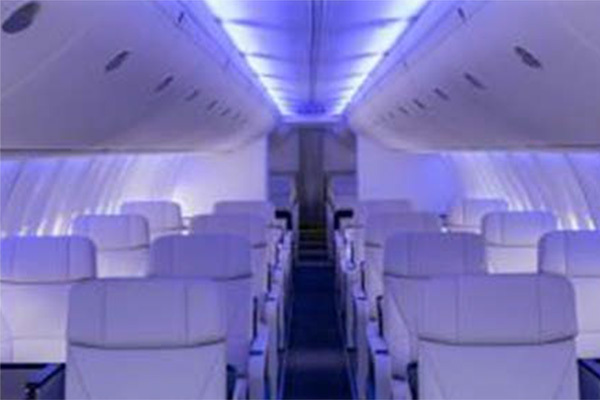 Extensive product line features LED cabin lighting, accent lighting, emergency lighting and information signage for all commercial and military aircraft. 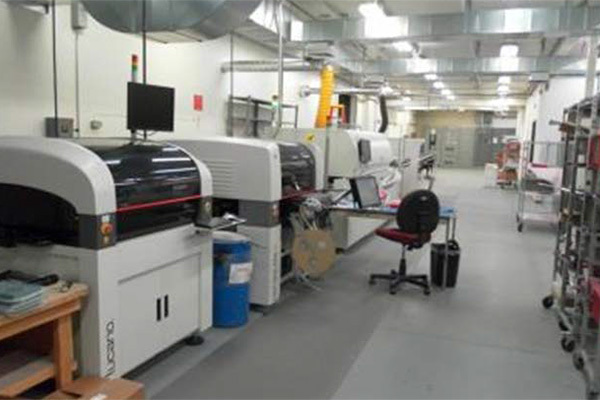 Proudly manufacture components and systems in the USA from our advanced facility in Dayton, Nevada. Welcome passengers with elegance and beauty through the most contemporary, high-quality LED lighting system available today. Bruce Aerospace provides a true plug-and-play cabin lighting solution featuring XLUME High Brightness LED technology, delivering exceptional quality and illumination that far outreaches OEM fluorescent and many other LED lighting systems. Bruce’s LED cabin lighting are quick and easy-to-install, cost-effective to enhancing any cabin interior and are of the highest reliable units with a MTFB (mean time between failures) in excess of 50,000 hours. 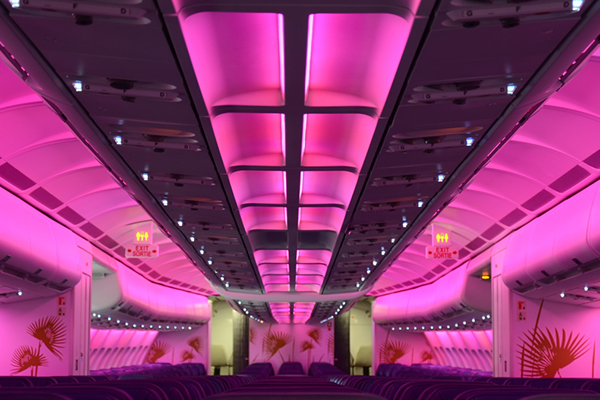 Set the standard for commercial aviation and enhance the cabin ambience for passengers with mood lighting featuring XLUME High Brightness LED technology. 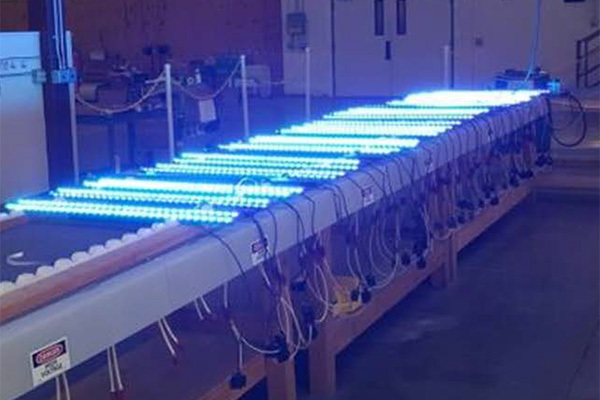 Bruce Aerospace utilizes a high quality, high brightness LED design versatile for both the primary white and RGB colored LED arrays. This ensures the highest output and full color saturation without washing colors out, and the highest purity white light source with no undesirable tinting. When seconds matter, have the utmost confidence passengers will be guided to safety with the most reliable emergency lighting platform. Bruce Aerospace’s PEEPLS™ Floor Mounted Emergency Escape Path Marking Systems and Pathfinder™ Seat Mounted Emergency Escape Path Marking Systems are reliable and provide a highly visible emergency exit path. 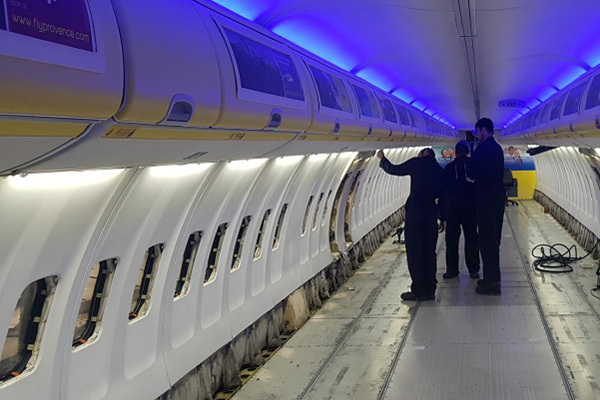 Our emergency lighting systems hold 28 STC’s on different aircraft models. From informational and emergency to custom on-board messaging and advertising, Bruce Aerospace designs, manufactures and certifies an extensive collection of easy-to-install LED regulatory and operational ordinance signage. Bruce’s signs are highly functional for ceiling mount applications, passenger service units and fore and aft bulkhead mountings. Custom graphics design and silk-screening capabilities are available. Meet with us while your here in Hamburg, or schedule a detailed review of your project at a later date.